*CE Credit will be available. PNS is approved by the American Psychological Association to sponsor continuing education for psychologists. PNS maintains responsibility for this program and its content. 4th Annual Charity Golf Outing in honor of Emily Reid O'Connor - September 20th. Eleanor M. Saffran Conference on Cognitive Neuroscience and Rehabilitation of Communication Disorders (co-sponsored by PNS). Participant will be able to describe methods used to test individuals with intellectual disability in order to ascertain neuropsychological profiles of relative strengths and weaknesses. Participant will be able to explain the Down syndrome neuropsychological profile. Participant will be able to discuss the neuroanatomical correlates of Down syndrome and how they may relate to aspects of the neuropsychological phenotype. 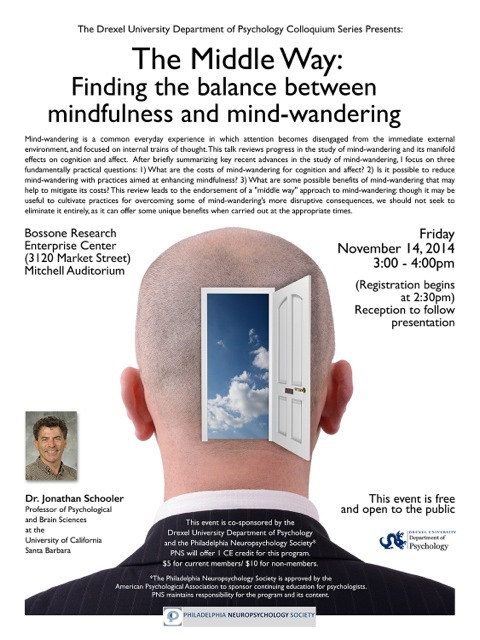 "The Middle Way: Finding the balance between mindfulness and mind-wandering"
Location: Bosssone Research Enterprise Center (3120 Market Street), Mitchell Auditorium.